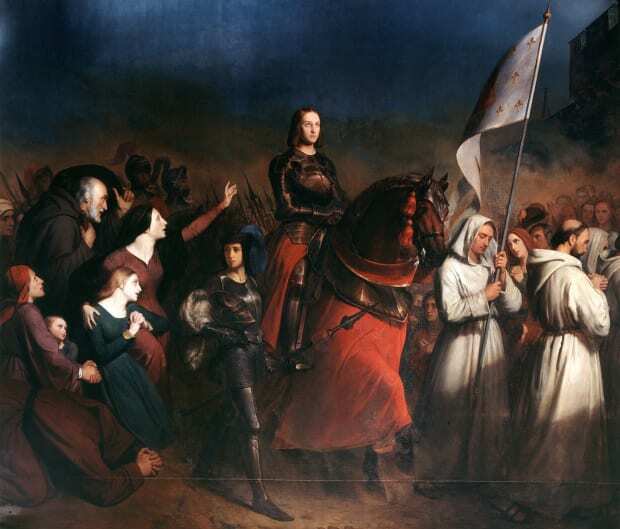 Why Was Joan of Arc Burned at the Stake? The French heroine and saint was labeled a heretic, fraud, sorceress and cross-dresser. The English claimed many offenses against . According to the trial transcript, Joan was questioned repeatedly not only about the voices she heard, but on why she chose to dress as a man. Joan of Arc, as painted by artist Jules Bastien-Lepage, in the moment when Saints Michael, Margaret, and Catherine appear to her in her parents’ garden, rousing her to fight the English invaders in the Hundred Years War. During the trial, St. Mary’s University notes, Joan faced six public and nine private examinations, culminating in The Twelve Articles of Accusation, which included the charges of dressing in men’s clothing and hearing voices of the divine. The church officials found her guilty, urging her to repent in order to save her life. The trial itself was an ecclesiastical procedure covered under canon law—a heresy investigation carried out as an inquisition, according to Hobbins.